Via Learn Online comes a timely reminder about free culture in this infamous presentation by Larry Lessig. Educators interested in the public domain, Google, the web’s influence on intellectual property and digital rights management should find this thought provoking. The stars are amazingly clear up here in Paraburdoo and the Space Shuttle flight that was visible earlier last year captured the students interest in the night sky. In fact we blew our monthly download limit in two days with many classes watching Yahoo’s live broadcast from the shuttle. Maybe this is old news to you, but I suggest anyone teaching Science add the free Stellarium to their teaching toolbelt, especially for the Earth and Beyond outcome. Being able to see a live depiction of the sky above from any geographical location certainly has a wow factor (but the pièce de résistance is the ability to turn off the atmosphere on a sunny day to see the space behind has instant education factor). 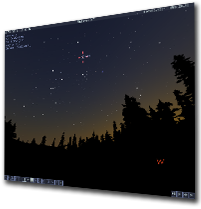 Stellarium is an open source desktop planetarium for Linux/Unix, Windows and MacOSX. It is quite impressive, so much so I’ve included it on our labs disk image for this year. Displayed with a projector it’s almost like having a planetarium in the classroom. The fact that it’s open source and cross-platform is just bonza. Stellarium - try it out, but if you want a bit of a preview you can check out the screenshots. Just amazing. Stellarium is an open source desktop planetarium for Linux/Unix, Windows and MacOSX. It renders the skies in realtime using OpenGL, which means the skies will look exactly like what you see with your eyes, binoculars, or a small telescope. Stellarium is very simple to use, which is one of its biggest advantages: it can easily be used by beginners.